We are blogging to inform you of a recently discovered security vulnerability reported yesterday in FreePBX Ticket 7123 (originally reported in ticket 7117 which is locked because of sensitive information). All FreePBX versions FreePBX 2.9 before 2.9.0.14, FreePBX 2.10 before 2.10.1.15, FreePBX 2.11 before 2.11.0.23, and FreePBX 12 before 12.0.1alpha22 are affected. You should immediately update your FreePBX Framework Module to secure your system from a potential attack. The vulnerability is a Remote Command Execution (RCE) attack which means a compromised PBX can have any system command executed on it. This may result in serious damage to the system or extraction of passwords and other credentials accessible to the apache user (which is asterisk on most systems). There were no known exploits at the time this issue was reported but upon going public it is common for hackers to develop scripts to scan the internet in an attempt to find vulnerable systems. The primary attack mode would be blocked on a system that uses HTTP authentication as some Distros set by default. Unfortunately, it is trivial to develop an XSS (Cross Site Scripting) attack that could indirectly access this vulnerability and allow an attacker to get access to any logged in system using all FreePBX authentication options. As such, all systems are vulnerable and should be updated. The fix addresses all attack modes. Please make sure to update your systems immediately. 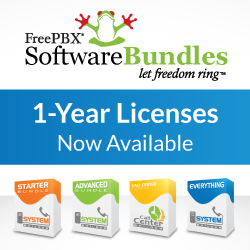 We informed project teams of the other popular FreePBX Distro’s earlier today as well as Certified Hosting Partners. The FreePBX and Schmooze Team!